I count the bundles of Eucalyptus trees that intersect Highway 92. I reach the third bundle, which hosts a narrow road leading up a steep hill; deeper into that bundle of Eucalyptus. The signs in front read, “Kastle Rock” and “Saturday Horse Camps.” I make the illegal left turn over the double yellow lines. I figure if a cop were to pull me over, I would probably be able to talk my way out of a ticket upon mentioning where I was going and what my purpose was. 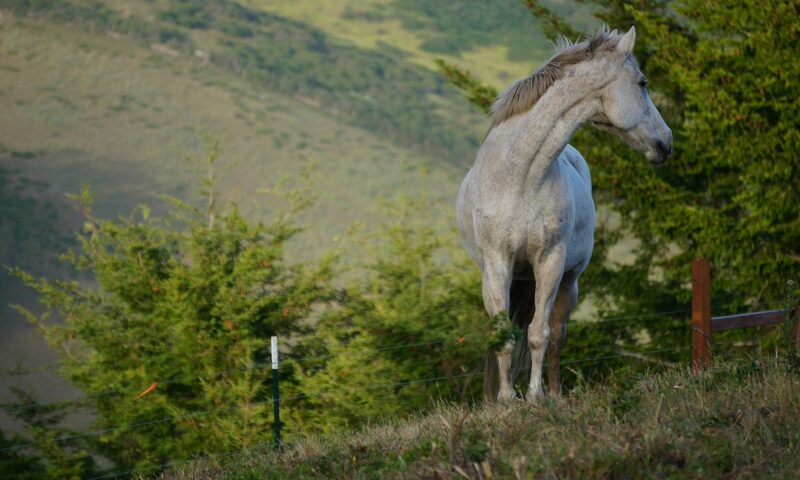 The Square Peg Foundation began the move from Canyon Creek Equestrian Center to Kastle Rock Ranch this weekend. The new property is only five minutes away from the old property. Geographic proximity leaves only a tiny sliver in one’s mind of what to expect with the new location. 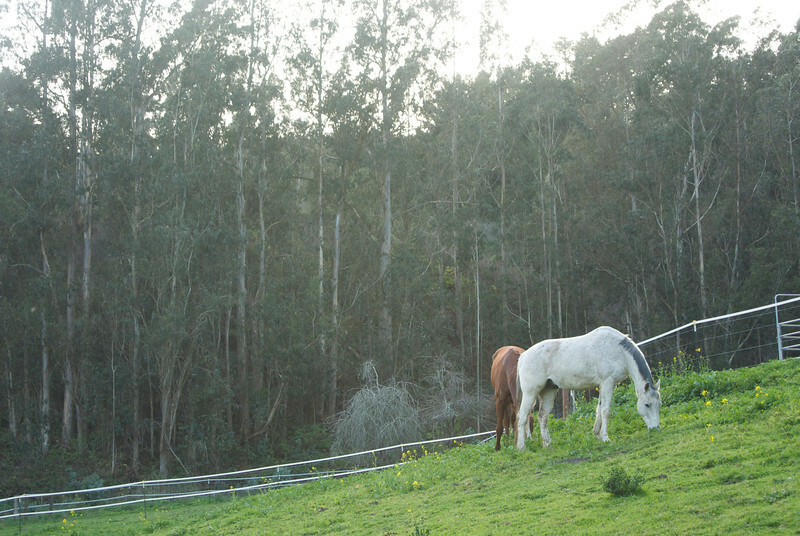 The road leads me to a final turn, putting me in front of a picturesque scene of a ranch nestled in spacious clearing of the Eucalyptus forrest. “Middle-Earth”, I audibly observe. I’m sure I’m not the only one who thinks this place looks like the freakin’ Shire. 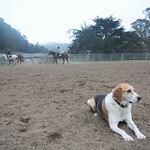 This weekend was not my first time at the ranch; however, it was the first time I felt like I was at home there. We are no longer visitors to this site, and the feeling is palpable. 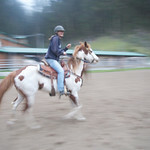 The ranch owners and management are not only solid business people, but also phenomenal company. They are knowledgable, warm, and patient (which is a must if you’re dealing with the wonderful chaos of Square Peg). Not to mention, they are fun! While watching them play a mounted game of Marco-Polo under the lights of the arena, where the june bugs danced, I found myself sporting a smile induced by gratitude for having found a place where laughter echoes through the hills, even after the sun goes down. As the intern, it is my primary responsibility to keep the facility organized. This is no easy task. Preemptive thoughts of moving and organizing (wonderful) chaos from point A to point B ladened me with lethargy. I like to think these semi-low expectations made the reality of the situation even more pleasant. Nonetheless, I was extremely pleased with the effort and results of all our fantastic volunteers’ hard work. No one disappointed. From Dave and Linda’s time pulling out the staples and washing walls in what will be the kids’ fort space, to the Stanford polo team tirelessly moving mats; everyone applied themselves and had results to show for it. I was giddy over the amount of progress we made. Giddiness was also partially due to the fact that there was a considerable amount of food provided throughout the whole process. Unmedicated Deborah was especially pleased (ADD folks know what I’m talking about here). 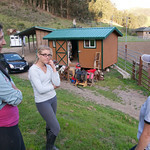 Deborah Rod, SFSU student and Square Peg intern pauses in the evening at the barn to think about all the possibilities. property. I laughed out loud when I noticed that a familiar patch of Eucalyptus trees from Canyon Creek Ranch had grown to form a perfectly symmetrical heart on the hillside facing Kastle Rock. You can’t make this stuff up. I don’t fancy myself a superstitious person, but something about that heart on the hillside affirms my belief that this is where Square Peg will start the next chapter of growth, and if magic is going to happen anywhere, it’s going to be here.